The definition of secured debt advanced by a Personal Insolvency Practitioner in the High Court clearly did not work when read in the context of the Insolvency Act 2012 as a whole. Mr Patrick Halpin gave a guarantee to Irish Nationwide Building Society (INBS) in respect of the liabilities of Crossplan Investments Limited. Elektron Holdings Limited was another guarantor. Mr Halpin’s partner, Ms Ann Keane, is a director and shareholder in Elektron. Irish Bank Resolution Corporation Limited (IBRC) is the successor in title to INBS. Elektron also owes money to IBRC, and as part of the security for its indebtedness, Elektron gave security over Aberdeen Lodge – a hotel or guest house in Dublin. In 2012, IBRC appointed a receiver over the assets of Elektron including Aberdeen Lodge. IBRC also appointed a receiver over the assets of Crossplan. In the High Court in 2012, IBRC obtained a judgment for €20 million against Mr Halpin, and it 2013 IBRC obtained judgment for a further sum of €6,338,369. The loans and related security were sold by IBRC to Kenmare Property Finance DAC, therefore the right to enforce those judgments now vests in Kenmare. In the High Court in 2015, Kenmare was given leave to issue execution in respect of those judgments against Mr Halpin. Following realisation made by the receiver over Crossplan’s assets, the amount now due on foot of the judgments is €23,933,503. In February 2018, Kenmare commenced bankruptcy proceedings against Mr Halpin in respect of the €23.9m unpaid judgment debt. The proceedings were adjourned to allow Mr Halpin to obtain the advice of a Personal Insolvency Practitioner, and thereafter Mr Halpin indicated that he was advised that he was eligible to apply for a PIA. In October 2018, Mr Halpin made an application for a Protective Certificate under s.93 of the 2012 Act. In the Prescribed Financial Statement (PFS), Kenmare was listed as an unsecured creditor in the sum of €23.9m, Aberdeen Lodge was described as Mr Halpin’s “Principal Private Residence”, there was no indication that it was in fact a hotel or guest house, and there was nothing to show that a receiver had already been appointed over Elektron’s assets (which included Aberdeen Lodge). In regard to Mr Halpin’s liability to Kenmare, the PFS indicated that there was a payment of €5,000 per month being made to Kenmare which was described as the “Principal Private Residence Lender – secured”, and it was suggested that there was a balance outstanding of €1,116,547. It was stated that Mr Halpin had personally guaranteed accounts in the name of Elektron and secured on the Principal Private Residence, and that the personal guarantee had not been called in, but the loan was in arrears. Kenmare complained that it was not a secured creditor of Mr Halpin, stating that the outstanding balance of €1,116,547 (for Aberdeen Lodge) was due from Elektron – not Mr Halpin. Since no demand had every been made under the personal guarantee given by Mr Halpin, the PFS was amended to how a balance of €1 on foot of the guarantee (as per ISI guidance). In December 2018, the Practitioner submitted that a s.105 valuation of Aberdeen Lodge was necessary to finalise the proposed PIA, and an order under s. 95(6) of the 2012 Act extending the Protective Certificate for 40 days was granted. In January 2019, the Practitioner submitted that a further extension was necessary to facilitate seeking creditor approval under the 2012 Act, and the High Court made an order extending the Protective Certificate for a further 40 days. Directions as to whether the debt of Mr Halpin to Kenmare is secured debt for the purposes of the Personal Insolvency Acts 2012 to 2015. An order declaring that the debt of Mr Halpin to Kenmare is not a relevant debt for the purpose of s. 115A of the Personal Insolvency Act 2012 (as amended by the Personal Insolvency Act 2015). Firstly, in finding, inter alia, that the Court was not misled in December or January, Mr Justice McDonald said there was no basis to set aside the order extending the Protective Certificate. It was submitted on behalf of the Practitioner that he had an obligation to seek to formulate a proposal for a Personal Insolvency Arrangement in terms which would not require the debtor to dispose of or cease to occupy the Principal Private Residence. The Practitioner submitted that the definition of “secured debt” in s.2 of the 2012 Act was sufficiently wide to cover secured debts owed by someone other than the debtor, and therefore extended to a secure debt owned by Elektron. Mr Justice McDonald said that for the practitioner’s argument to have any prospect of success, the definition of “secured debt” in s. 2 had to “be read on its own without reference to any of the other provisions of the Act”, and that it involved a consideration of the definition in “isolation divorced from the way in which that term is subsequently used throughout the Act”. 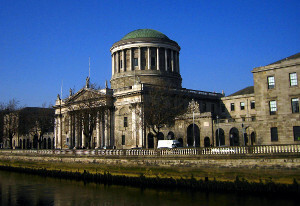 Finding that the practitioner’s approach “very clearly” did not work, Mr Justice McDonald said that the practitioner sought to “shoehorn the definition into the sections of the Act dealing with secured creditors notwithstanding that those sections are, demonstrably, the wrong fit for the proposition that the practitioner seeks to advance”. “When one considers the definition of “secured debt” in the context of the Act as a whole, it is clear that it is intended to apply solely to a debt of the debtor which is secured over property of the debtor in favour of a secured creditor (as defined)”. Accordingly, Mr Justice McDonald held that the debt of Mr Halpin to Kenmare was not a secured debt for the purposes of the 2012-2015 Acts (concerning Aberdeen Lodge). In those circumstances, Mr Justice McDonald said there was no scope for the application of s.105 of the 2012 Act – which he explained was “concerned solely with the valuation of property of a debtor which is the subject of security in favour of a “secured creditor” (i.e. a creditor of the debtor who holds in respect of his debt, security over the property of the debtor)”. Mr Justice McDonald said s.105 “plainly does not extend to the property of Elektron”. In light of his conclusion in relation to the meaning of “secured debt”, Mr Justice McDonald said it was “fairly obvious that, even on the assumption that Aberdeen Lodge is the principal private residence of Mr Halpin, there is no debt of Mr Halpin secured over that property and it would appear to follow that s. 115A cannot be availed of”. However, given that a meeting of creditors was yet to be held, Mr Justice McDonald said there had been no requirement to seek to invoke s.115A, and therefore it was not appropriate to go so far as to make a determination. It was enough to merely observe on an obiter basis that the answer to the question posed by Kenmare “seems obvious”.